Lillian Davids taught us the first few steps of creating a crackle, 3D birdhouse. We painted the acrylic base color, added a layer of crackle, and then we added a coat of Buttermilk acrylic paint. 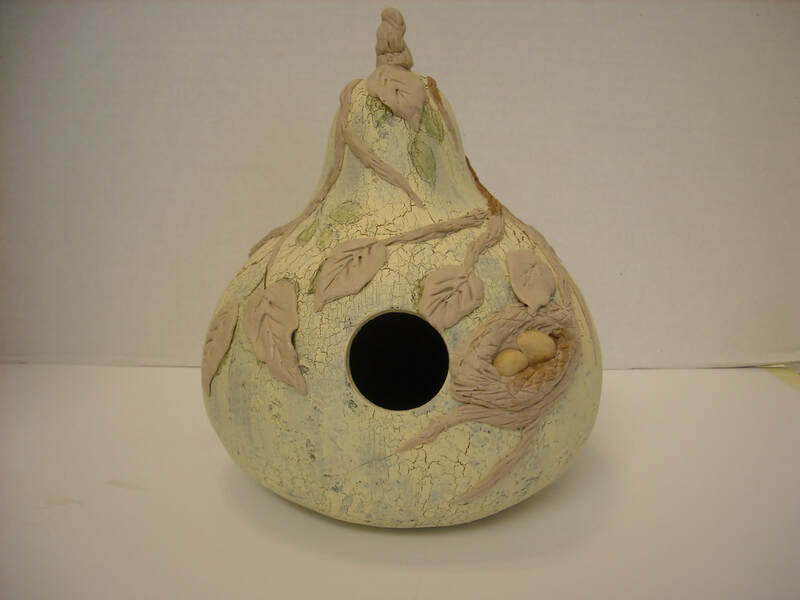 Next, we used Quickwood to create vines and leaves on the birdhouse gourd. ​We continued working on our birdhouse gourds in March. ​Gourd Nightlight Luminary taught by Teresa Vales was a big hit! Our annual TGP Holiday Party hosted by Sue Hanehan was held in December. Margaret Jerman taught us how to create a gourd with an inverted lid. ​Sue Hanehan taught us how to make a Crackle Snow Angel. Road trip #3! We went to the Triad Mini Festival in Winston-Salem at the Dixie Classic Fairgrounds. ​Another road trip! This time we ventured to Paulette's farm and saw how she grows gourds. We bought birdhouse gourds from her and drilled holes in them for a future project. ​We went on a field trip to Judi Fleming's studio and made chickens out of an egg gourd and Quickwood. ​Joanne Ward taught Huichol beading on a gourd. Ellen Healy taught us how to create miniature Easter baskets out of egg gourds. Lillian Davids taught us how to paint and decorate an Easter egg gourd. We learned to use a white charcoal pencil to draw a pattern on the egg gourd. We then used a liner to paint lines and a stylus to decorate the pattern with dots. Teresa Vales taught us how to create a teneriffe design on a ring. Now that we have made this teneriffe design, we can learn how to cut a large hole and drill smaller holes around the large one to create a teneriffe design on a gourd. Diane Frankenfield, assisted by Judi Fleming, taught us how to make penguins out of penguin gourds. Nov 12, 2016 - Gourdament making...just in time for the holidays! Thank you, Paulette! What a blast! Ellen and Paulette created kits to make a mini bottle gourd snowman. Check it out! Here are pictures of our donations gathered to date to give to previously homeless vets. We met at Paulette's Tee shirt shop and ellen taught a class based on what she had learned in Cherokee. We decorated the outside of the gourd and cut cork and glued it to a base which was glued to the gourd lid. The trick was sanding the gourd so that it fit the opening of the gourd tightly. We have a basket of gourd goodies to give away to a lucky raffle ticket holder. To get a raffle ticket, bring a finished gourd to the October meeting. Each gourd donated will earn one raffle ticket, and the gourds will be donated to the veterans who have received housing this year. A win win! We met at Paulette's tee shirt shop and had the pleasure of visitors from the Capital Area Decorative Arts of NC as well as other first-timers. Welcome all! We shared our latest creations and then Barbara McGeachy taught us the braided rim. Afterwards, we had a pot luck lunch and were joined by NC Gourd Society officers and had a meeting to plan the Gourd Arts and Crafts Festival to be held in the Holshouser Building at the state fair grounds September 10-11, 2016. We met at Judi Fleming's house and studio. Judi gave us a two-hour class about judging gourds for gourd contests. Members who attended that class are now eligible to be clerks (writing down what judges say) and able to take further training to become a judge. We had a delicious pot luck lunch and then learned how to use Quickwood on an egg gourd to create an animal. We met at Paulette's tee shirt shop on Banks Road. Patch members brought various things to work on individually. Sorry, no pics! Class began with Sue showing us the techniques for the grapevine gourd project. Paulette provided the gourds she had cleaned for a fee if anyone needed one. Barbara McGeachy taught different decoupage techniques to enhance our birdhouses. Paulette Disbrow sold us some craft-ready birdhouses. Also, we showcased our sassy sheep from last month! Thanks to Judi Fleming, we had directions and warty gourds to make Sassy Sheep. Members met at NC State's Craft Center and drilled holes, glued dowel rods and egg gourds, and used QuickWood to make hooves, noses, ears, and necks. Members are to bring their Sassy Sheep to the next meeting and/or send a picture to Ellen. Meet us Saturday, Jan. 9th at NC State's Craft Center from 1 PM to 4 PM. This class will go over getting started in woodburning goods. Paulette Disbrow will teach us how to get started in woodburning gourds. This will be at a beginners level since we have all levels of experience in our group. For those who want to try a project. Or if you have your own gourd. I will have 2 wood burners with assorted tips and breathing masks if the fumes bother you. Anyone with a wood burner please bring it so everyone will get a chance to try this. Also I am happy for imput during the class from those of you with wood burning experience. Also bring small to size drawing or artwork of something you would like to try. It is a lot of fun. It does take practice to make smooth lines and keep the depth consistant. I think I have covered everything. If not we will figure it out Saturday. In December we decided to have a holiday party and exchange handmade gourd ornaments. 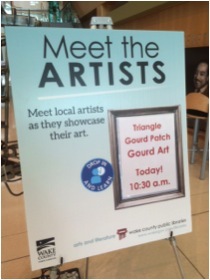 The Triangle Gourd Patch was the guest artist in November 2015 at the five Wake County Regional Libraries “Meet the Artist” events. At each event, two or more patch members sat at a table and greeted patrons with a display of gourd art. We talked about the gourds and distributed fliers for the N.C. Gourd Society, Festival 2016, Triangle Gourd Patch, and the NCSU Crafts Center spring classes. At each one-hour event, we talked with 25 to 50 library patrons. They were amazed at our gourd art, and a few people asked to join our patch or the N.C. Gourd Society. The patch members who participated were Jan Alexander, Lillian Davids, Paulette Disbrow, Vanya Elliott, Sue Hanehan, Ellen Healy, Barbara McGeachy, and Beth Sykes. Ellen Healy led members of the Triangle Gourd Patch and the Triangle Basketweavers’ Guild in creating 30 pieces of gourd art (mostly bowls) for some veterans in our area. These veterans were formerly homeless but the Veterans Affairs Supportive Housing found homes for them in 2015. At the annual party, Ellen presented the gourds. Each veteran chose a gourd. It was thrilling and touching to see how delighted they were! The Triangle Gourd Patch donated a “patch”work gourd to the NCSU Crafts Center as a fund-raiser. Jan Alexander donated the gourd and wood-burned 15 sections. Throughout 2015, patch members took turns decorating the sections using various techniques such as painting a cardinal and dogwood flowers, wood-burning the Hatteras lighthouse, applying egg shells, wood-burning a Celtic knot and applying gold leaf, Zentangling, carving and using faux cactus fiber, decoupaging, etc. The gourd is stunning. The Crafts Center sold it for $200 at the annual Crafts Fair on November 21, 2015. Pictured below with the gourd, left to right: Elizabeth Pittman, Paulette Disbrow, Ellen Healy, Sue Hanehan, Lillian Davids, Joanne Ward (in red, behind gourd in one photo), Barbara McGeachy (in blue, behind gourd in one photo), and Vanya Elliott. At our October meeting we did not have the NC Gourd Society meeting as had been announced. That meeting will be Nov. 14. Also, we decided to defer the short presentations on gourd treatments for when our meeting has more time. At the October meeting, Paulette Disbrow from Hector's Creek Specialty Farm provided gourds for us to purchase at a minimal cost. Thank you Paulette, and thank you Lillian Davids for our art lesson filled with tips and tricks. We had a short business meeting and then an art lesson from Lillian showing us how to paint the base coats for our Santa gourds that we will finish in November. We used a 3/4" brush for the base coats. First we drilled holes where the cord will go to hang the ornament. Next we painted the whole gourd with Driftwood. We then drew where the face will be and painted it with a flesh tone. We painted the band above the face and the tip of the hat with Honey Brown (which will eventually be white fur). We used Country Red to paint the hat and a suggestion of a coat. We painted two coats of each color and used a heat gun to dry them. Our next meeting will be at NC State's Craft Center on Saturday, Nov. 14 at 1:00 PM. We will have a Triad/Triangle/NCGS (NC Gourd Society) meeting and then finish our Santa gourds. Welcome all! If you are new to our Triangle Gourd Patch (TGP), it would be helpful (but not necessary) to let one of us know you are coming (see the Contact Us page on this website.) You need to know that we charge $2 to participate in the month's project and the cost of materials is usually quite minimal. Paint will be provided at a minimal cost. The brushes needed for the November meeting are listed below. Most of the brushes can be purchased at a craft store or Jerry's Artarama, but Lillian cautions that the better quality brush you have, the better the end product. The deer foot brush may be difficult to find. If you'd like to order one, please let Ellen know (Contact US) by Oct. 19 and she will do a group order. The paints we will be using are listed below. Bring a piece of palette paper or a plastic palette. You may want to bring small plastic containers with lids (condiment cups) to use as you paint or use if you need to take a small amount of paint home. Some condiment cups and lids will be available. Thanks again to Paulette and Lillian for a productive lesson. We met at Paulette's T shirt shop and had a business meeting. Lillian demonstrated how to use four metallic acrylic paints and apply them to a gourd in a graduating color blending. We met at Paulette's T shirt shop and had a business meeting. Lillian showed us the cardinals she painted on the raffle gourd, and passed the gourd onto Paulette. We created a schedule for the next few patch members' turns at filling in a panel on the raffle gourd. Paulette demonstrated how to clean a gourd, and we then cut open gourds and cleaned them out. Judy Fleming taught us how to make gourdaments. We met May 9 at Paulette's in Raleigh, which is a great place to meet - Thanks, Paulette! Barbara taught the Suede Lacing Rim on a gourd. Jan brought a large gourd which she divided into sections for each of us to decorate and donate to the NCSU Crafts Center for a fund raiser at their November craft fair. Library. We will send at least one member to each of the 5 regional libraries for a 90-minute opportunity for the public to learn about gourd art. Ellen, Joanne, Paulette, Vanya, and Barbara (at a minimum) will participate. More than one person can attend each one so hopefully everyone can join in. Barbara will work with Susan Neilson at the library to arrange the details. Project: Christmas Ornaments taught by Ellen Healy. Basically, we took a round piece of gourd that had holes drilled along the perimeter and transferred a Christmas image onto the gourd using a wood burner. We painted the image and use waxed linen to add pine needles around the rim of the ornament. Jan Alexander taught us how to apply eggshells to gourds for a beautiful mosaic effect. Jan brought some samples to previous meetings and they are beautiful. She used gourd shards to make pendants.